It took only a year of severe practicing before Jeff Loomis won Wisconsin’s Guitar Wars contest at the age of 16. Although Loomis got his first guitar when he was around nine years old, he only started practicing with it passionately at 15. Today, Loomis is an American guitarist who has become famous globally for his skills as a former lead guitarist for Nevermore -a progressive metal band that he was a part of from 1992 to 2011. As a young teen, Loomis took inspiration from great artists like Marty Friedman, Yngwie Malmsteen, and Brian May. Before finding a career in music, he drifted from one cover band to another and played with two death metal bands before joining more established groups. After his victory in Wisconsin, Loomis took the plunge and auditioned to be the lead guitarist for the iconic thrash metal band, Megadeth. To his disappointment, he was told that one day he would make a great guitarist, however, was far too young for the group as a sixteen-year-old. In 2008, the prediction came true in a surreal manner when Megadeth invited Loomis to temporarily join them as a lead guitarist when then guitarist Glen Drover decided to exit the band. However, Jeff declined to continue working on his first solo album as it was already fast underway. His path to success was not direct. After playing with numerous unknown bands and being rejected by Megadeth at 16, he refused to accept rejection and joined Sanctuary in 1991. To his disappointment, Sanctuary broke up two months later due to musical differences with individual band members. Starting in late 1991, He, Warrel Dane and Jim Sheppard (ex-Sanctuary) spent three years conceptualizing a new band called Nevermore. Not only was Loomis one of the primary songwriters for Nevermore, but he also set the precedence for the Nevermore signature sound using seven-string guitars. On April 21, 2011, he and Van Williams left Nevermore, citing personal and musical differences with Warrel Dane and Jim Sheppard. The solo album, titled Zero Order Phase was released in 2008, featuring guest solos from Ron Jarzombek and Pat O’Brien amongst other artists and also the album Plains Of Oblivion in 2012. 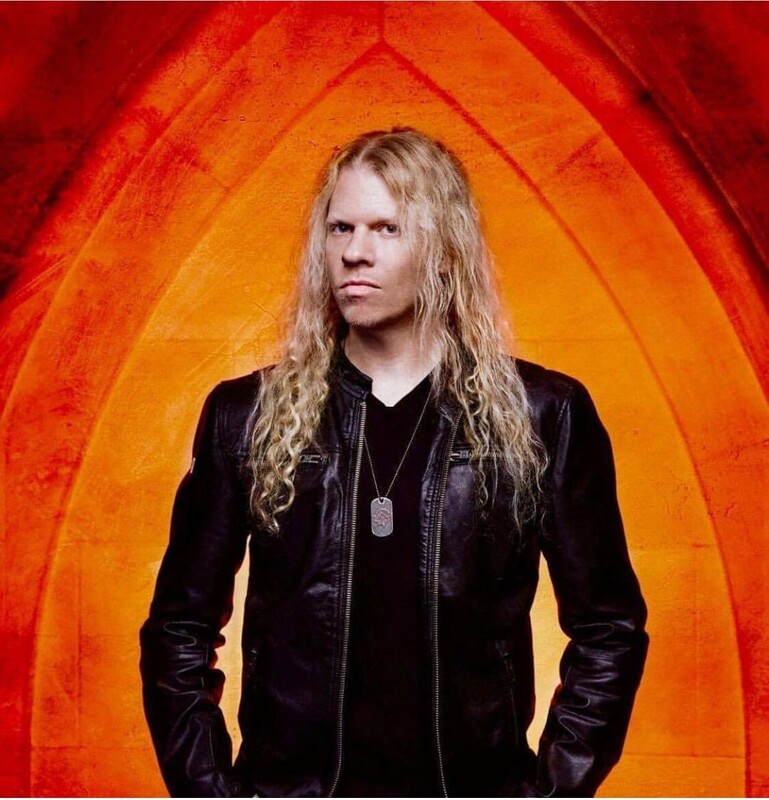 Since leaving Nevermore and dabbling shortly in a solo and guitar clinic career, it was announced that Loomis joined melodic death metal band – Arch Enemy – on November 17th, 2014. We caught up with Jeff to get an update on what he’s doing. Tell me a little about your background. You’re not the typical “LA” guy. JL: I lived in Wisconsin until the age of 19, and there wasn’t much going on their musically speaking regarding metal bands. I grew up in Appleton, and the closest big city was Milwaukee. I’d have to go to Milwaukee to see concerts and do my record shopping. I was fortunate enough to get an audition with the band Sanctuary from Seattle, and that was my first big break. That’s what brought me out to the west coast. I auditioned for them in 1991, and I got the gig, but it didn’t last long. It lasted about two months, and then the band disbanded. That’s how Nevermore was formed. Me, Warrel and Jim wanted to stay heavy musically speaking where the other members didn’t want the same thing. Nevermore was created out of Sanctuary. That lasted 18 years, and it was a big part of my life. Now, I’m in Arch Enemy, and it’s my next chapter in my crazy musical life. How was your audition with Ozzy back in 2009? JL: I got a call from Blasko (Rob Nicholson), the Bass player and I also got an email from our Ozzy’s management. It happened very, very quickly and then I flew down to Los Angeles. I played five songs with the band. Ozzy didn’t sing; he was just sitting on the couch just watching. I did meet him very briefly, and it was terrific. I looked up as I was setting up my gear and all I saw was this hand with tons of gold jewelry on it coming down to shake mine haha. Sharon asked me how old I was, and at the time I was 38, and I think they were looking for somebody a little bit younger or maybe somebody that looked a little bit different than I did. Of course, Gus G got the gig and he very well deserved it. He’s a friend of mine, and he earned it. I just moved on to Nevermore for a few more years after that initial experience. Do you and Chris Broderick communicate or get a chance to catch up? JL: I don’t talk to Chris as much as I used to. We’re both so busy. You know, after he was in Megadeth we fell apart a little bit and didn’t talk to each other for quite some time. I’ve seen Chris at NAMM of course, and it was an amicable conversation. We caught up with each other and said hello and shared some stories about what we’ve been up to. Just two busy guys are doing their own thing. It was refreshing to have him in Nevermore while it lasted. Obviously a great player. I’m glad he’s able to write his music now and be able to share it with his new band. How are you coping with the passing of Warrel Dane? JL: I hadn’t seen Warrel too terribly much, maybe just a few select times since the band broke up. He passed away when I was at home during Christmas break from touring with Arch Enemy. It was a terrible experience for me to go through as with anyone who loses a close friend. I’m still grieving over it and I probably always will be for a long time. Primarily when you’ve known somebody for so long and toured the world and wrote music together, you become very close like brothers, and that’s what we were. To make a long story short Warrel was a troubled guy, he had issues with alcohol and at one point so did I. I would never single him out and say he was the sole issue of why we broke up as a band. I was a terrible drinker at one time in my life. I’ve been sober for five years now. I’ve gotten my life together, and I’ve got a very clear and focused mind and health wise I’m doing very well, When Warrel continued to drink, it just kept me from really talking to him a lot. I just wanted to keep my distance from that kind of thing because I was trying to live a cleaner lifestyle. The times that I did speak with him or texted him, it was always very friendly, and we told each other how we missed one another. There were some talks about doing a reunion and writing some more songs. So that was something I was kind of excited about and unfortunately, you know, that will never happen now. I have fantastic memories and killer music that we wrote together, and that will always be a great reminder of what we shared. I’m going to miss him very much. He was a great friend of mine, and I can’t say enough good things about him. He was an incredible lyricist and an incredible vocalist as well. He was a very different person, a tough one to figure out. He was intense with his lyrics and a brilliant guy. When you were contacted about joining Arch Enemy, how did you react to that? JL: At that time I was focusing on my solo career, and I was doing a lot of guitar clinics and instructional things. I got the chance to meet with fans because I never really got the opportunity to talk to fans too much about my guitar playing, my technique and the way I approached the instrument. So these guitar clinics gave me the chance to do that, to put me one on one with the fans and the guitar freaks so to speak so I could answer all their questions. I had just gotten back from doing a Conquering Dystopia guitar clinic with Keith Merrow, and I got an email from Michael asking me if I would be interested in joining. I didn’t second guess it too much because I had the need to want to tour again and be in front of a lot of people performing. The thing with Mike and I is that we go way back. I’ve known him for almost 18 years. Nevermore and Arch Enemy toured together back in the day. I met him a long time ago at a festival in Europe, and we’ve always kept in touch over the years. When he initially asked me to join the band, I was like, yeah I’m down to this idea because I’m genuinely a fan of the band. I liked the music, I love the heaviness of it, and I liked the guitar harmonies. I, of course, ended up joining the band and literally within two weeks I was onstage in France playing my first show with them. So it happened very, very fast. I’ve now been in the band since been November of 2014. It’s going very well so far. We’re very busy, and we’re always on the road 10 or 11 months out of the year. How long did it take for you to get comfortable playing Arch Enemy’s music? JL: It’s a big change for me. Arch Enemy’s a six-string guitar band, and they’re tuned down to C, So it took a little bit of getting used to for me to learn some of their approaches to the way they write music. Arch Enemy has a particular formula in the way that they write songs. It’s much different than the way I write. It wasn’t too hard for me as I felt pretty focused learning the songs. I think it was a good thing that I got thrown into the whole mix quickly. It made me learn everything very fast and I just quickly became familiar with the songs like that. Since joining the band, I have a lot of musical ideas that I’m hoping I can contribute in the future. I did write three or four songs for the last album, but they didn’t make it only because it wasn’t in the style that they were looking for. Fortunately enough I was able to play guitar solos on the latest album, so that makes me happy. I’m looking forward to the future to maybe writing some songs with them and becoming more of a member so to speak, you know, so that’s cool. I’m delighted with my position. I’m very fortunate to play in front of so many people every night and to be able to tour the world and see so many cool places. I consider myself a lucky guy. Some people feel you’re not getting any freedom to give creative input on Arch Enemy songs. JL: If you were to reverse the whole thing and make me Michael for instance, let’s go back to when I was back in Nevermore right? That was my band. I called the shots in that band, I wrote the songs, and we like arch enemy had the ever revolving door of guitar players coming in and out that wanted to write and participate. We granted that to some players that wrote cool songs like Steve Smyth and Tim Calvert. For the majority of it was Warrel Dane and I that wrote most of the music. It’s kind of the same thing with Arch Enemy, Michael and Daniel handle a lot of the writing. They know what Arch Enemy is supposed to sound like simply because they are the founders of the band plain and simple. I didn’t want to be that guy that came into the band and said, here are ten songs and they’re going to be on the next album. That’s not right to do that. So I’m just giving it time, and I’m just hoping that on the next record, maybe there will be that opportunity. I can see how people think that. I completely understand….just going to have to give it time and see what happens. What made you leave Schecter Guitars? JL: I have nothing but good things to say about Schecter Guitars!. Excellent people that work there. It was just one of those things where I was with him for 12 years and wanted a change. I think my legacy was always the Jeff Loomis JL-7 model. It’s always been the model that’s sold the most and is the most popular. I tried some other guitar designs with the company, and they weren’t so successful. I just felt personally like I wanted to move on and be a free agent and be able to play whatever I want to play because I’m an avid collector of guitars. I’ve got a bunch of Les Pauls and Strats, and they’ve always been sitting around my house collecting dust. When it comes down to an endorsement, you can only play what you’re endorsing, and I wanted more freedom to play any guitar out of my collection. I got fed up with that. I was just like, guys, you know, I think my time has come where, after 12 years of being with the company I just wanted to be free. That’s what happened, you know, they were a bit disappointed. I think sometimes you need to change and you just move on from it and try something else. So I’m a free agent right now, and I’m delighted where I am. Is there a solo album shortly? JL: Yes there is. I initially signed on with Century Media for three solo albums and of course I had two one in 2008, and I did one in 2012. I have a very cool record company, Century Media; it’s also the label that Arch Enemy is on. So I’m touring all the time with Arch Enemy, they’re very, very patient with me and they’re like, We know how busy you are with Arch Enemy so take your time with it, and once it’s done, we’ll release it. That’s where it stands right now. I’ve got a bunch of ideas, foundations for like five or six songs. It’s just all a matter of me finding the time to do it, and to be honest with you, we actually have a month and a half coming off after we tour Australia and Southeast Asia so I’m going to really try to batten down the hatches and get some of those ideas together and hopefully just finish it. Are you going to be playing guitar on Alissa White-Gluz’s solo album? JL: It’s something that we’ve been talking about. It’s just that we’re so busy with the World Tour for the “WILL TO POWER” campaign and she had to take a break from writing for it as well…. but yes, I did say yes to contributing to two or three songs. So that’s kind of where that stands and that should be coming out sometime late this year or early next. Previous Previous post: Kahler Guitar Bridges: Better Than A Floyd Rose? Next Next post: Chris Broderick And Jeff Looms: The Best Guitar Duo Of The Decade?